The holidays gave me some extra time to explore testing the speed of the new Mac mini against a high-performance iMac for video compression. The results surprised me so much that I’ve created two articles with my results. 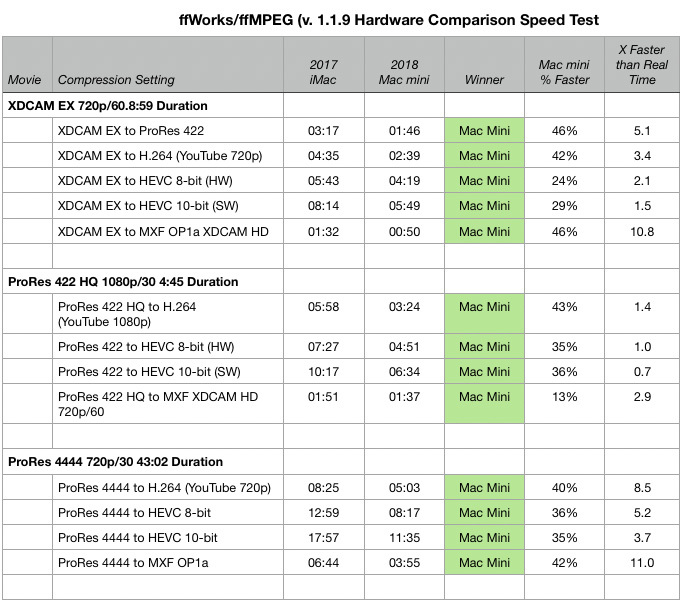 This article covers the differences in hardware, while this article compares Apple Compressor, Adobe Media Encoder and ffWorks/ffMPEG running on both systems. Almost all video compression is CPU-based. The software you use for video compression makes a big difference in speed and file size. This is the Mac mini I used for testing. It’s the high-end 6-core Intel i7. It has a 1 TB internal SSD. The i7 is multi-threaded, which yields faster results than an i3 or i5 Mac mini at the same clock speed. 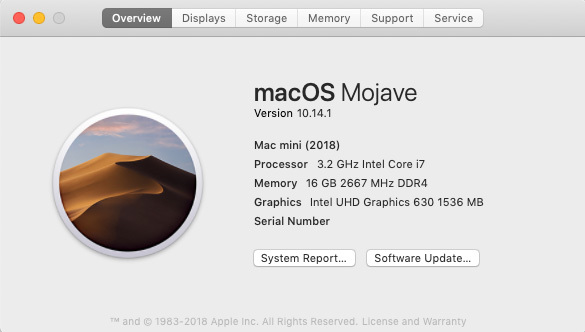 This Mac mini is also running the latest version of macOS. NOTE: Here’s an article that explains the differences between an i3, i5 and i7 CPU. This is the 27″ iMac I used for testing. It is 4-core Intel i5. While it has a faster clock speed, the i5 is not multithreaded. This will prove to be significant in the tests. It, too, is running the latest version of macOS. There are so many potential variations of codecs, frame sizes and content that it is impossible to test all the permutations. So, I chose to create 78 different tests using three different source file codecs – XDCAM, ProRes 422 HQ, ProRes 4444 – then compress them into five different codecs – ProRes 422, H.264, HEVC 8-bit, HEVC 10-bit and MXF OP1a. NOTE: I didn’t see any benefit to testing against older gear. Older computers would only be slower. Computers older than 2015 don’t support hardware acceleration, which makes them far slower for H.264 compression. Also, HEVC is only supported in High Sierra or later. Each file was compressed with all source files stored on the internal hard disk of each computer. Each file was compressed individually, there was no batch processing. Only the compression software was running on each computer. The same versions of the macOS, compression software and settings were used on both computers. Adobe Media Encoder was set to use Metal, rather than Open CL. All software was current as of the date of this test: Nov. 24, 2018. The same files were used on both computers. File durations ranged from 5 to 45 minutes. Each software logs how long a compression job takes. I used these log files for timing. If you are running an older computer, and doing a lot of video compression, the Mac mini will save you time. Depending on the computer and compression software you are using, it can save you a LOT of time. NOTE: Every computer configuration and movie will yield different timings. My goal here is to help you compare systems, not predict how long any specific compression will take. ProRes is a codec technology developed by Apple for high-quality, high-performance editing in Final Cut Pro X. 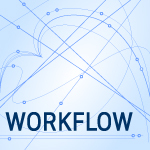 …Apple also licenses and certifies ProRes for specific third-party products and workflows. In some instances, unauthorized codec implementations have been used in third-party software and hardware products. Using any unauthorized implementation (such as the FFmpeg and derivative implementations) might lead to decoding errors, performance degradation, incompatibility, and instability. I use ffMPEG to create H.264 files from ProRes masters. I have found its image quality and file size to be superior to that created by either Apple Compressor or Adobe Media Encoder. I have not had any of my compressed files rejected for technical reasons. This is why I included ffMPEG in my tests. However, it concerns me that ffMPEG is using unlicensed ProRes code. This is inappropriate and potentially dangerous. While my test results stand for comparison purposes, I will start looking for other compression software to use in the future. NOTE: The KnowledgeBase article from Apple, above, lists all licensed implementations of ProRes. There are a lot to choose from. Yellow bars indicate where the Mac mini was not as fast as the iMac. The “X Faster than Real Time” column describes compression speed in terms of how much faster than real time the process will take. 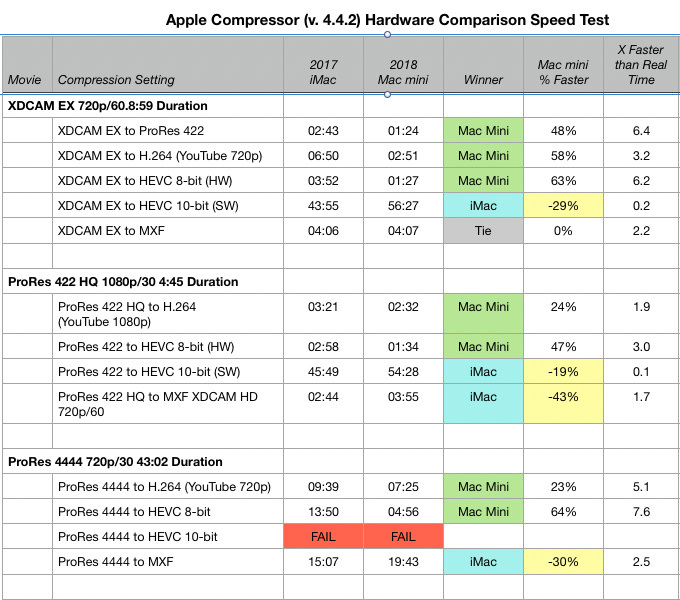 If you tend to use Apple Compressor, this table shows where the Mac mini will be faster and by how much. NOTE: Apple Compressor failed consistently on both computers to compress a 10-bit HEVC file. I tried two separate files, two times each. It failed each time. It was the only software to fail in any of these tests. Failure occurred after 2.5 hours of processing. If you tend to use Adobe Media Encoder, this table shows where the Mac mini will be faster and by how much. My current favorite compression software, ffWorks/ffMPEG, is illustrated in this table. While hardware tells only part of the story, the limitations of the GPU for the Mac mini do not hamper it from becoming an inexpensive video compression powerhouse. If your goal is improved video compression, you only need to upgrade the CPU to the 6-core i7. Additional RAM, SSD storage capacity and 10 Gb Ethernet, while nice, won’t improve compression speeds. In general, the more cores in the CPU, the faster it will encode media. So, an iMac Pro would probably be faster than the Mac mini for some tasks. However, as I understand it, the iMac Pro does not support hardware acceleration for H.264 or HEVC compression. 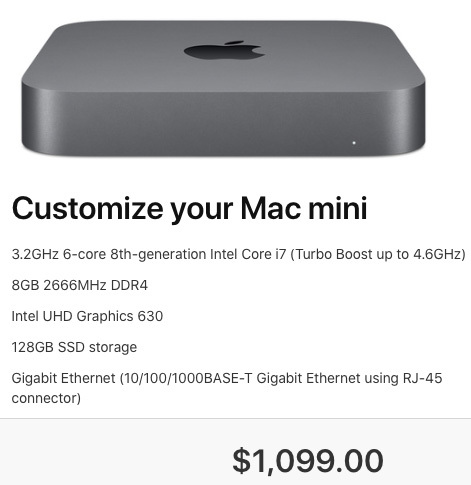 For those codecs, the Mac mini would be faster. NOTE: Remember that the Mac mini can run “headless,” that is, without a keyboard, mouse or monitor if you control it remotely from another computer. This further decreases the cost of adding a computer. Apple Remote Desktop or VNC Remote Desktop are two applications you can use to control a Mac remotely. Here’s a PDF of all my findings and notes (64 KB). Be sure to read this article to learn more about the significant differences in compression software that I used for this test. interesting Larry..wonder how the test would have been using a 3.6GHz quad‑core 8th‑generation Intel Core i3.. I suspect a larger diff gap? This was very helpful and timely considering my upgrade needs. I now have to rethink things ! Thanks for great content as always, Larry! Thought I’d correct one part though. You state that machines older than 2015 will not have any hardware acceleration for encoding. This is not quite the case. In fact, the Sandy Bridge CPUs first used in 2011 Macs included Intel Quick Sync, which accelerated encoding and decoding of H.264 up to 1080p. The follow-on Ivy Bridge CPUs in the 2012 lineup improved Quick Sync to support 4K H.264. HEVC/H.265 acceleration was introduced into Quick Sync in Skylake, which was used in the 2015 iMacs and 2016 MacBook Pros. Thank you for this Larry. A) Can you please confirm that you were using Metal over OpenCL for your AME tests? B) Which mac year/models (starting point) have you found a noticeable improvement in using Metal VS OpenCL? 1. Yes, I was using Metal for the AME tests. 2. I haven’t tested Metal vs. OpenCL, so I don’t have a reference for which Macs yield which results. Well, here’s my results…I was intrigued by the Metal v. OpenCL question, so I tried it. 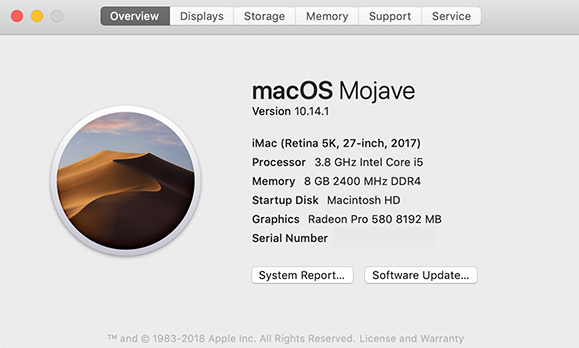 I’m using a Late 2013 trashcan Mac, running 10.12.6 (Sierra), with a 3.5 gig 6-core Xeon E5, 32 gig RAM and the AMD FirePro D500 (not that we care about gfx cards here). AME version is 12.1.2 (build 69). I did an h264 compression on a 22 minute show. We normally recorded at 24p 1080p PR proxy via 7Q+ / Apollo recorders. While our media is cut and exported in the Adobe PP/AME space via 16TB+ RAID 0’s via multiple machines over TB2 – we are trying to determine future upgrades for our bays. We still have a handful of “late 2011 17″ 8,3’s” which run overnight renders via OpenCL. Any additional reports on Metal vs. OpenCL render results from you or PEOPLE ON THIS THREAD would be very useful to the community. Again, thank you Larry for your amazing research, reports, and clear reports in this constantly evolving landscape. MIKE – if you have other systems to run a similar Metal vs. OpenCL AME export, I would very much like to know your results.